Visit us now at the 8scape Sales Gallery. 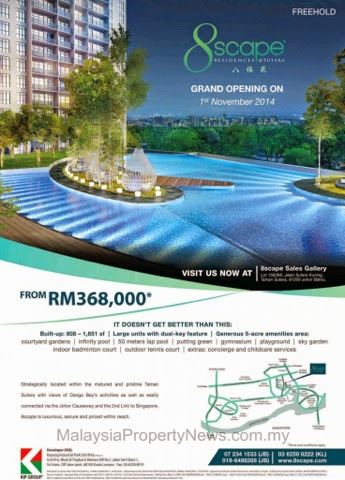 Condominiums for sale from RM368,000. It doesn’t get better than this. Built-up from 808 sq ft to 1,651 sq ft. Large units come with dual-key features. Generous 5-acre amenities area. Strategically located within the matured and pristine Taman Sutera with views of Danga Bay’s activities as well as easily connected via the Johor Causeway and the 2nd link to Singapore.